bio-light autumn full body suit "Huashen"
Home » bio-light autumn full body suit "Huashen"
The Huashen autumn full body suit is capable of emitting bio-light waves of 5μm to 25μm which penetrate the skin by 3-5cm and cause high-frequency micro-vibrations in blood vessels. These slight vibrations allow the inner walls of the blood vessels to clear out lipid deposits that have collected over time. The result is an increased volume of blood within the vessels, accelerated blood flow, improved micro-circulation in human body, enhanced human immunity. Huashen autumn full body suit is developed around the internal energy medicine and TCM Blood circulatory system physiotherapy concept, the bio-light emitted by the dots in body suit acts directly on Conception Vessel (Ren Mai), Governing Vessel (Du Mai), bladder channel, stomach channel, soothing the channels and quickening the vessels, regulating qi and blood, not only can comprehensively complement human body energy, improve human body tolerance to cold, but also can effectively relieve genital system disorder, gastrointestinal discomfort and, pain in waist and legs. 1.Long usage results in dredging of channels, regulation of qi and blood, supplementing yang-qi in human body. 2.Comprehensively regulates the organ function in human body and expels toxins. 3.Improves micro-circulation in human body, activates tissue cells, lubricates the tissues surrounding joints and relieves joint pain. 4.Prevents cold and keeps body warm. 1.Those suffering from genitourinary system diseases. 2.Those suffering from stomach cold, plenitude, diarrhea, chronic enteritis. 3.Those suffering from pain in knees and back, lumbar muscle strain. 4.Those who suffer from a below-average health condition and seek alternative health care. 1.The inner material of the body suit should come in contact with the skin directly. 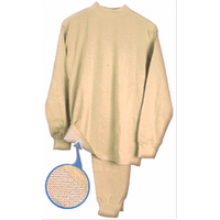 3.Best results will be obtained by wearing the body suit along with other bio-light clothing.